We got this delicious and easy recipe from our friend Rebecca and now Charlie and I make it quite often. We've modified the recipe a little (reflected below), but not much. Rebecca's original recipe is vegetarian but we often make it with pork or turkey. Mix onions, garlic, tomatoes, Worcestershire sauce, beans, and broth in very large pot. Start heating on medium high heat. Stir the cumin, chile, and cayenne into the meat and cook another minute or two. Stir the meat into the pot with the other ingredients. Bring everything to a boil. Lower heat and simmer for 5 or 10 minutes -- or longer if you like. Add more broth if it's too thick. 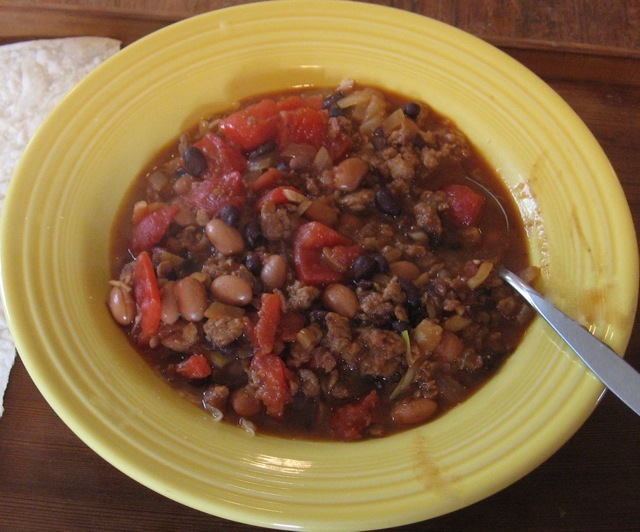 It is good served with cornbread or tortilla chips or tortillas. And some like to put a little grated cheese or sour cream on top.